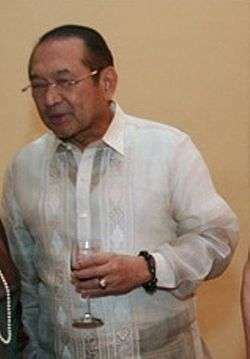 Eduardo R. Ermita was the Executive Secretary of the Philippines, and spokesperson for President Gloria Macapagal-Arroyo was born on July 13, 1935 in Balayan, Batangas. Ermita took his Defense Resource Management Course at Naval Postgraduate School, Monterey, California, U.S.A. from 1978–1979; Command and General Staff Course, Fort Bonifacio, 1974; Unit Psychological Officers Course, Kennedy Center, Fort Bragg, North Carolina, U.S.A., 1970–1971; Special forces Course, Fort Magsaysay, 1962–1963; Counterintelligence Course, Special Intelligence School, Fort Boniofacio, 1962; Airborne School, Fort Benning, Georgia, U.S.A., 1961; Ranger School, Fort Benning, Georgia, 1960-1961. Ermita was a three-term congressman defeating the one of the most influencial political family in the first district of Batangas from 1992-2001. He was appointed on October 3, 2003 as Secretary of National Defense. He is the provincial chairman of LAKAS-CMD in Batangas and Regional chairman of Lakas CMD in CALABARZON since 1992. Ermita is married to the former Elvira Ramos from Dipolog City with whom he has four children.